amazing mattress! I have a low profile boxspring that is used with this and the support is perfect. Such a good purchase that I am planning to purchase another. 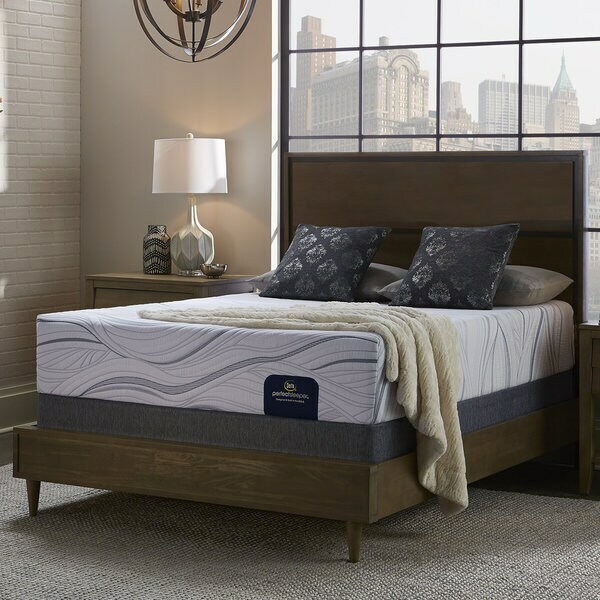 This Mattress also features two layers of Serta's PillowSoft Foam, an extra-soft foam that gently contours the body to provide enhanced cushioning. I've had this mattress for several days and I love it. It's soft but supportive. I had a pillowtop mattress before this one and had back problems. I woke up every morning in pain. This mattress has alleviated that problem. It supports my lower back and I wake up without back pain even if I change positions. The memory foam is also very good for not creating a lot of noise or movement in the rest of the mattress so it would be good for sleeping with a partner. I'd recommend getting the low profile foundation unless you want a very tall bed, because it's a meaty thick mattress. I've had it for less than a week, but it seems to be very well made. Well worth the money. Everything was as advertised. I've had the bed for about 2 weeks now. It has given me the best nights of sleep in my life. Not to soft and not to firm. Very quiet too. My wife doesn't wake me in the morning getting out of bed anymore. I truly love this bed. I do recommend the low profile foundation unless you like having the bed sit up high. "I have a queen split adjustable base. Is the Serta Perfect Sleeper Shimmering 12-inch Split Queen-size Gel Memory Foam Mattress Set for $ for one or two parts of the split queen? I need a mattress for the entire adjustable foundation." "Is the "regular foundation" compatible with an adjustable/power base? If so, do you sell them? Also, can you tell me how this "Shimmering 12" compares/contrasts with the "Luxury 12" noted in a recent Consumer Report magazine article?" Replacing old pillow top Beauty Rest Mattress with the memory foam mattress for better back alignment and improved sleep throughout the night. "It sounds like the foundation is split but nowhere does it say the mattress is a split two piece. I have an adjustable bed and need both foundation and mattress to be split and adjustable separately. does this do that?" "Will this bed fit in my existing wood frame? Its antique and matches surrounding furniture. Also will delivery guys take old mattress & box spring?" Yes, it will fit in a standard sized frame. The delivery team will haul away your old mattress and box spring at delivery.